Let’s continue on our quest to create a yoga lifestyle—a life where peace and stillness are not limited to the confines of our yoga mats. Let’s build a life where clarity and stillness extend to all other areas of our lives. A couple of weeks ago, we began the process of removing mental clutter by developing the habit of creating a nightly to-do list. By creating a to-do list, we made the conscious decision to commit our jumble of thoughts and obligations to paper and set an intention to live the next day with purpose. 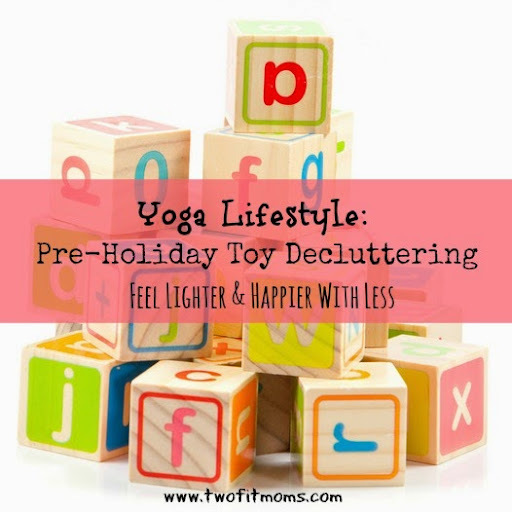 This week, let’s focus on an area that is the cause of anxiety for so many parents—toy clutter. Toy clutter is overwhelming because there is just so much of it. Toys can easily overtake bedrooms, play rooms and family rooms. Trust me, I’ve seen it happen in my own house. With the gift-giving season right around the corner, the likelihood of more toys entering your home is very high. Now is the time to tackle this project of paring down and organizing. Your ultimate goal is to declutter your toy collection and organize your play space so that your children are left with items that they enjoy and can easily find. In the process, you will find that you feel lighter and happier with less. Before you begin tackling the clutter, take a moment to consider why the clutter exists in the first place. Without taking this important step to stop and consider why the clutter exists, the root cause of the problem will not be addressed. Dealing with physical clutter is only a temporary solution unless you become honest with yourself and do a little bit of soul searching to put an end to the mess. -Why do my children have so many toys? -Am I contributing to the excess by purchasing more? -If so, why do I buy more? -Do other family members contribute to the glut of toys in the house? -If so, can I have a discussion with them to stop the influx of toys? -Do I throw an extra toy into the shopping cart just because it’s inexpensive? -Do I buy toys throughout the year, even if it’s not a major holiday or a birthday? -Do I keep all toys, even if they are not age appropriate? -Do I keep toys, even if my children do not play with them? This is not an exhaustive list of the questions that you may ask yourself, but it is a place to start. Once you are done reflecting, it’s time to begin managing the clutter. If this is your first time decluttering, I highly recommend distributing the work across multiple days. Doing it all at once is very overwhelming. Start with one large box and one large garbage bag. The large box will hold all toys that will be donated. The large garbage bag will hold trash—Not all toys are in good enough condition to pass down to another child. When your box and bag are filled, STOP! Assess your energy level. Can you tackle another full box and bag today, or are you tired? Do not continue if you’ve lost steam. Your play area/kids’ bedrooms/family room did not become cluttered in one day, so give yourself some time to return your home to working order. You can do it, one box and one bag at a time. -Keep items that can be classified as art supplies: stencil kits, beading kits, sewing supplies, markers, crayons, glue, tape, paper, paint, stickers, etc. They foster creativity and will ultimately be used (even if only for homework and school projects). -If your child regularly plays with the toy, keep it. If your child does not play with it, find it a new home. -Try to overcome your own feelings of guilt. Do not keep a toy just because it was a gift or an expensive purchase. Avoid hoarding, and find a child that will truly enjoy the item. -If the toy has significant sentimental value, keep it. You don’t need to keep 50 stuffed animals, but if your child had a favorite doll or teddy bear as a baby, save it. There is nothing wrong with maintaining a few mementos of times gone by. -If the toy/game is broken or has missing pieces, throw it away. -Donate toys that are in good condition and intended for a much younger child. There is no point in cluttering your home with toys that are not age appropriate.